Our gallery consists of Original artwork work by renowned artists along with limited edition prints and giclees. As a young boy, the sight of an RAF squadron flying over Nicholas Watts' house sparked a passion for capturing a moment in time. Early classroom sketches of dogfights, aerial battles, Spitfires and Hurricanes, developed into a mastery of technical art. Nicholas Watts grew up near Brands Hatch and the experience of watching motorsport from an early age also had a profound effect on Watts. He was soon channeling his artistic flair into his first ever car commission, a Bugatti Type 37A. Nicholas Watts has a passionate and atmospheric style in his work. His technical grounding and the sense of proportion and perspective that it teaches shines through within all of Nichoals Watts' pictures. Alfredo de la Maria was born in Uruguay in 1945. He studied art and architecture at the Bellas Artes School in Montevideo. At 18, he served as an illustrator of politics and sporting events for a newspaper in Montevideo. In 1961, he conducted his first exhibit of equestrian paintings in Punta del Este City. His studies about Polo are legendary. Additionally, his paintings of naval and aviation subjects were also much in demand. In 1966, he left for Europe where he settled in Paris for three years. Returning to Argentina, he took a position with an important publishing company in the city of Buenos Aires creating illustrations for the covers of many major magazines. 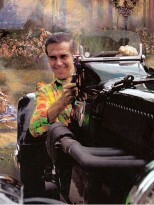 During this timem, he became totally involved in automotive art. 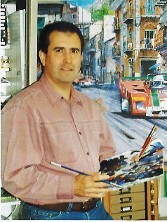 In 1989, he made the first of his may exhibits at the Buenos Aires Classic Cars Club.